Versions of Oxygen are locked software. The Oxygen Microscope is developed for work with M-Box (microscope): M-Box 2.0, M-Box 1.5 and M-Box. The system uses projects created by Helium Rough and Helium IG. 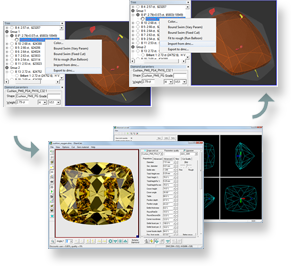 Oxygen Microscope software allows to create photos of rough by microscope, define any type of inclusions, explore and work with the diamond cutting solutions, allocate diamonds, evaluate the prices of the different possible solutions and quality of the polished diamonds, create customer reports and reports for allocated diamonds. What is new in the Oxygen Microscope Server? InstallOxygenServer-Microscope.exe is an installation program for Windows (116 Mb). The installation should be run with an administrative account. 1) Unable to access HASP SRM Run-time Environment. You may need install newer hasp device driver. Solution: Download and update the hasp device drivers from the section below. 2) Feature not found. You may need to update hasp key firmware (H0031). Solution: Please update the hasp key firmware using the update utility. Before starting firmware update process please close all the programs and any special tools that may affect the normal work of the hasp usb device driver. M-Box works with 64-bit Windows 7 and 64-bit Windows Vista with Oxygen Microscope since vesion 3.2. After connecting the hardware to the computer you will be asked for drivers for OctoNus USB devices. Download these drivers below. OctonusBoardsDriver_x64.exe (0,5 Mb)- drivers for OctoNus USB devices. Please note that new 64-bit drivers do not work on Windows XP and 32-bit operation systems, where old 32-bit drivers should be used.